Ah, the 90’s, the decade that gave us the Spice Girls, the X-Files and the dreaded Furby (aka furry devil). It was a time where innovation and pop culture reigned supreme and there was never any shortage of fresh ideas. Video games were exploding on to the scene in this era and in the midst of all of the Sonic, Mario and Bandicoot’s emerged a different kind of game. 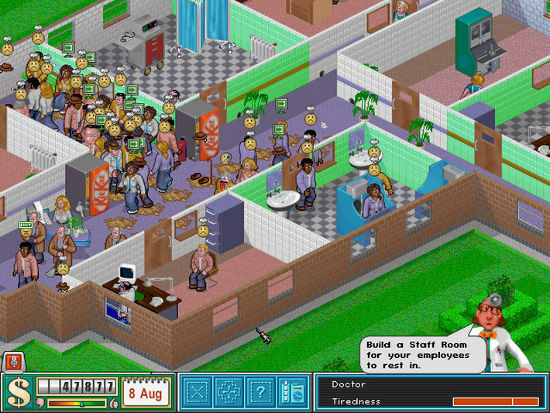 Theme Hospital was the PC simulation game which allowed you to run your healthcare facility with the click of a mouse. The gaming platform called for it’s players to tend to all staff and patients needs whilst ensuring all equipment was working efficiently. Players were all seeing and all hearing. Everything they needed to know about their hospital was displayed on screen. If an emergency room was empty you could instantly send a doctor to the area and cure the patient (avoiding a visit from the grim reaper whose presence was rife if your hospital was not performing as it should). Imagine the benefits a system like this could bring to a modern day hospital. With a constant eagle eye view hectic hallways, stressed staff, unhappy patients, misplaced equipment – these could all become a thing of the past. Skip forward to 2016 and Locatible has allowed for these ideas to become a reality. With Locatible’s cloud-based real time platform you can allow your hospital become an all-pervasive hub. 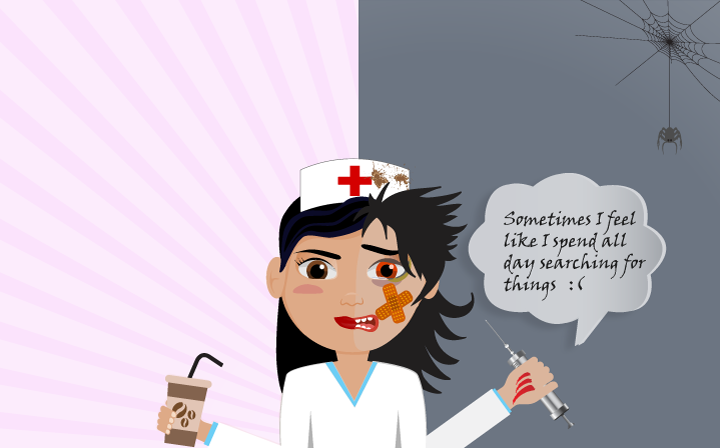 Much like Theme Hospital, Locatible uses a live map to monitor daily hospital occurrences. With this sixth sense technology, potential issues can be easily spotted and a solution put in place. Before now, hospitals had far inferior methods of identifying bottlenecks in their procedures which was hugely problematic. If a piece of equipment went missing hospital staffs time would be greatly impeded upon as they had to spend their time blindly searching for it (Up to 74 minutes of staff time is lost per shift searching for equipment). Fewer methods were available to monitor and control the spread of infection in the healthcare industry. 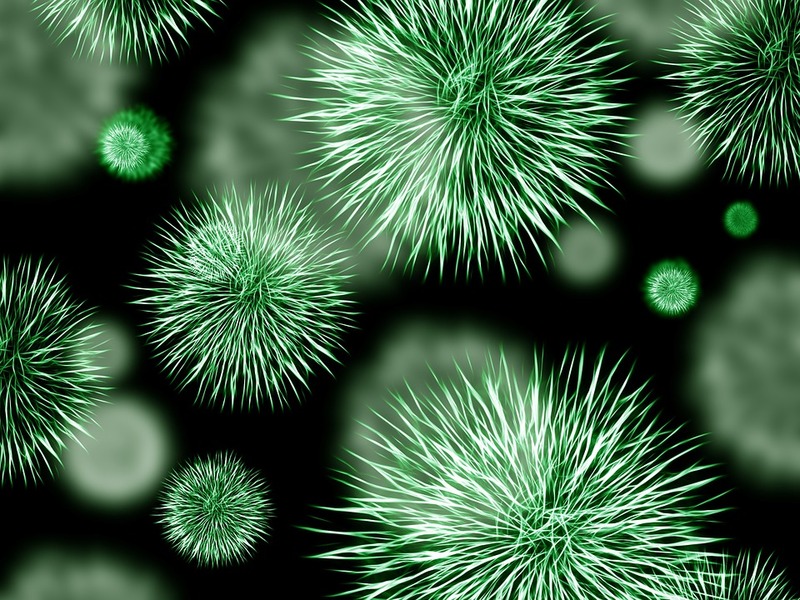 With nearly 2 million people being affected by hospital acquired illnesses annually Locatible can provide the tool to manage the spread of these infections by knowing who came into contact with who and then taking appropriate precautionary action. Patient fall alerts can be created to give staff instant notifications when a patient has fallen over or is in need which massively boosts hospital safety levels. 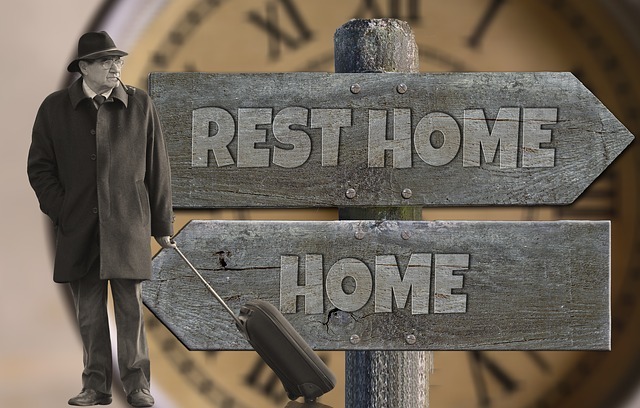 The wandering management element helps to fight the very serious issue of Alzheimer’s patients wandering (60% of patients who suffer from Alzheimer’s & Dementia will wander, and of this figure 46% will die if not located within 24 hours) by being able to locate them with 3 feet accuracy and ensuring patient safety at all times. 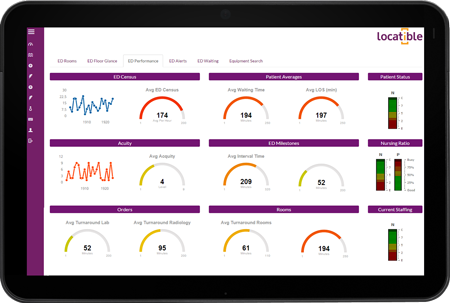 The analytics screen provides users with 18 different key performance indicators (KPI’s) which allows hospitals to pinpoint areas that need improvement such as patient flow, waiting times etc. In addition, live data is constantly available on any part of a hospital which is an invaluable asset in the healthcare industry. Locatible offers a solution to so many common healthcare problems by providing users with an easily navigable system and the highest level of accuracy, modernising how a hospital should be co-coherently run while still ensuring optimum productivity. Thanks to the latest technology Locatible is completely safe to use in all areas of a hospital (including operating theatre) and does not interfere with any machinery making Locatible the obvious choice for someone looking to implement a real time location system in their healthcare facility. We can show you how Locatible assists in areas such as patient/staff tracking, infection control, healthcare analytics, patient flow and a number of other areas over on our website. Have any of you played Theme Hospital? Let us know in the comments.